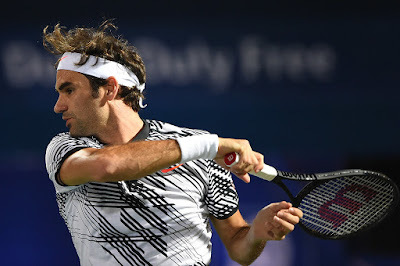 Roger Federer began his quest for a record eighth title at the Dubai Duty Free Tennis Championships with a 6-1, 6-3 win over Benoit Paire in just 54 minutes. It is his 13th appearance in Dubai, and as well as winning seven titles he has twice finished as runner-up. It was Federer's first match since winning the Australian Open last month, his 18th Grand Slam title. But the 35-year-old Swiss showed no rust in the rout, winning nearly 70 per cent of his service points and saving all three break points faced. Federer broke Paire twice in the first set as the Frenchman struggled to stay in rallies. The Swiss broke twice more in the second set to earn his fourth win in as many tries against Paire. “There were some break points to be saved, and, you know, I think I returned very well for a first round. I was able to get my second serves in deep, was able to go into the offensive quickly,” Federer said. Federer will meet a Russian in the second round, either veteran Mikhail Youzhny or qualifier Evgeny Donskoy. He improves to 48-5 at the tournament with the win against Paire. He faces a tough road from here, though. Top seed Andy Murray and second seed and defending champion Stan Wawrinka could meet Federer in the semi-finals and final, respectively.